If there&apos;s a factor that might encourage a player to take the enemies head-on, it&apos;s the fact that there are a lot of people to execute in this orphanage. In fact, this level might feel overstaffed, unless these henchmen were anticipating taking on Agent 47. With this non-stealth approach comes the less discrete options to kill, such as using a trusty shotgun or knocking out a guy with a crucifix. 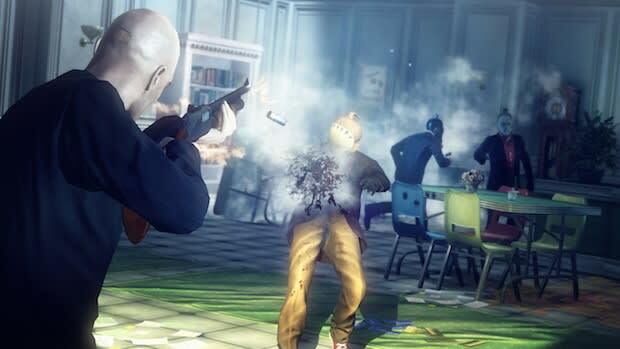 Whatever the case, he&apos;s equipped; not only is the Instinct feature helpful, but once 47 makes an entrance, the player can turn on a slow down effect to mark and execute several targets. We got to witness this in action during a cafeteria shootout, which also included the obligatory explosive gas tank. With this kind of aggression, it was of little surprise to see the guard saved this time around. That made me wonder: is there the possibility of saving the guard on a stealth playthrough, the kind of outcome that could potentially lead to the sought-after Silent Assassin rank?